The yellow-wattled lapwing (Vanellus malabaricus) belongs to the family of plovers, dotterels, and lapwings, Charadriidae. 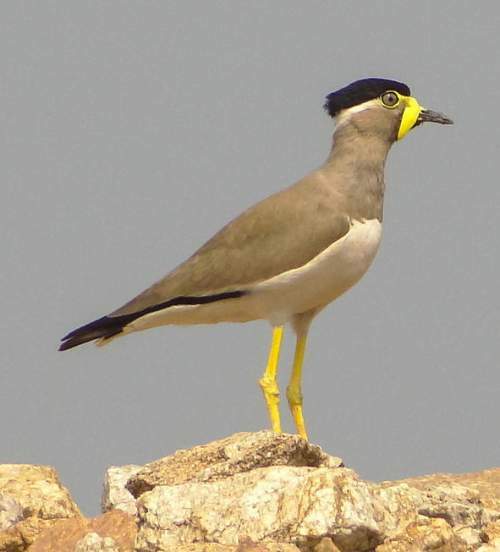 The yellow-wattled lapwing species are distributed in India, Nepal, Bangladesh, Pakistan and Sri Lanka. These lapwing species are endemic to Indian subcontinent. These lapwings are monotypic species. The yellow-wattled lapwing (Vanellus malabaricus) is a medium-sized wader, measuring 25 to 30 cm in length and weighing 100 to 200 grams. The wingspan is 65 to 70 cm. The yellow-wattled lapwing species have the characteristic, prominent triangular yellow facial wattles at the base of the bill and forehead. There is a black or brownish black crown, separated by a border of thin white band. Excited bird can raise crown feathers. In these lapwings, the neck and the upperparts are sandy brown. The rump and the tail are white. Excluding the outer tail feathers, there is a subterminal black band on the tail feathers. The breeding yellow-wattled lapwings have black patch on the chin and throat. The flight feathers are black and there is a white wing bar on the inner half of the wing. The throat and the upper breast are buff brown. In breeding lapwings, the breast is separated from the white belly by a diffuse blackish band. The rest of the underparts are white. The lapwing bill is short and dark gray with yellowish base. The irises are pale brown. The long legs are yellow. The feet extend well beyond the tail while flying. These species do not have hind toes. The juvenile wattled lapwing is a dull version of the adult. The wattle appears small and dull. The chin is white. The cap is pale brown with dark striation. The upperparts may have dark markings. The call of these yellow-wattled lapwing species is a descending "ke-oo..ke-oo", a high pitched repeated “twit.twit.twit” or a sharp "tchee-it" sound. The yellow-wattled lapwing species are distributed in India, Nepal, Bangladesh, Pakistan and Sri Lanka. Vagrant birds have been observed in Myanmar and Malaysia. 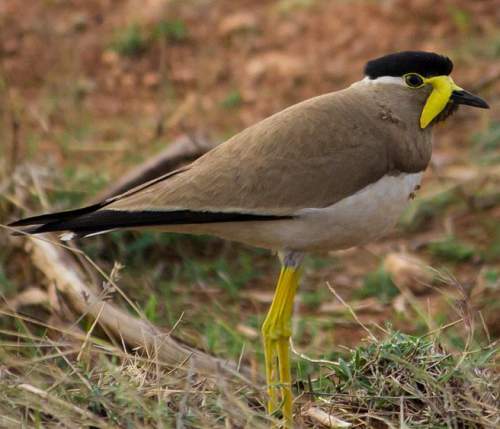 In India, these yellow-wattled lapwing species are distributed in the states of Himachal Pradesh, Haryana, Uttarakhand, Uttar Pradesh, Bihar, West Bengal, Odisha, Andhra Pradesh, Telangana, Chhattisgarh, Jharkhand, Madhya Pradesh, Rajasthan, Gujarat, Maharashtra, Karnataka, Tamil Nadu and Kerala. The Important Bird and Biodiversity Areas (IBA) of these yellow-wattled lapwing species in Nepal are Sukla Phanta Wildlife Reserve and Koshi Tappu Wildlife Reserve and Koshi Barrage. These yellow-wattled lapwing species do not normally occur in forest. They are rather dry-country lapwings. These species normally occur in altitudes from 0 to 100 meters. The artificial ecosystems of these yellow-wattled lapwings include open grounds, dry fields, rice fields, open ﬁelds with stubbles, fallow ﬁelds and arid pasturelands. 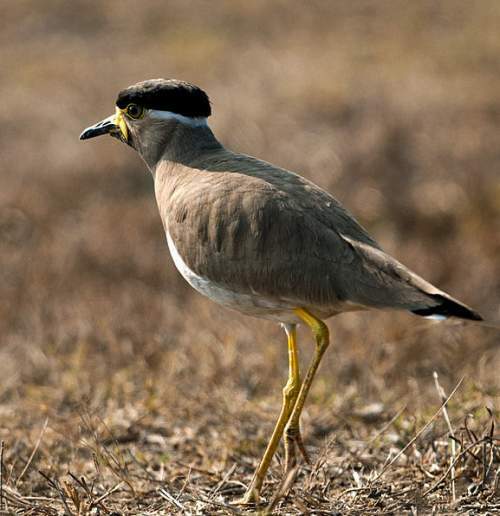 The natural ecosystems of these yellow-wattled lapwing species include fringe of wetlands, exposed mudflats and shorelines of wetlands, marshes, swamps, peatlands, arid grasslands and temperate grasslands. The diet of the yellow-wattled lapwing consists mainly of insects. Grasshoppers, crickets, locust, beetles, caterpillars, grubs, mantids, stick insects, spiders, macrobenthic fauna, macrophytes, cereals and grains are their primary food. The yellow-wattled lapwing species are mainly terrestrial birds and obligate visual foragers, catching prey from the surface of the ground or from low vegetative cover. The chicks feed on small insects, annelids, cereal, spiders, small frogs, millipedes and small toads. The breeding season of these yellow-wattled lapwing species is from March to May in India. The laying season in Sri Lanka is from March to August. The breeding season is from April to June in Pakistan. During courtship, the yellow-wattled lapwing male produces high frequency notes with fully puffed breast. The female in the vicinity responds by repeated short calls. They make fly and dive display, which culminates in mating on the ground. These wattled lapwings are monogamous. The male selects the breeding site. The site is usually located on open sparsely vegetated ground in the vicinity of water body. Both the male and female build the nest. The nest is a slight depression on the ground. The typical wattled lapwing clutch contains 3-4 eggs. The eggs are soil-brown with black and creamy blotches. Pebbles and soil balls are accumulated from nearby areas and placed in the nest to provide camouflage to the eggs. The yellow-wattled lapwing pair take turns to incubate the eggs for about 28 days. Though the eggs are laid with a difference of a few days, hatching is synchronous. The hatchlings are covered with brown black down feathers, providing perfect camouflage. The yellow-wattled lapwing hatchlings are nidifugous and leave the nest soon after hatching. The parents feed the chicks with small insects, spiders, millipedes and earthworms. Parental care goes on for nearly one month. The breeding yellow-wattled lapwing pair actively defends its territory from other birds. The parents distract the intruders away from the nest. They also defend their nest from stray dogs, shikra and crows. On warning call from parents, the chicks squat and freeze. The parent lapwings may soak their breast feathers at the watering hole and, returning to nest, brood to cool the eggs and chicks with water. A second brood may be raised, particularly when the first fails. The yellow-wattled lapwing species are non-migratory resident birds. They make short distance movements in rainy season. The movement pattern is not clear. Post breeding, the juvenile lapwings may disperse and establish in new locations within the range. They may make local movements for feeding and breeding within their range. The global population size of the yellow-wattled lapwing (Vanellus malabaricus) is estimated to number 3,300 to 6,700 mature individual birds. The overall population trend of these lapwing species is reported to be stable. Throughout its range this lapwing species is reported to be uncommon to rare. The generation length is 8.9 years. Its distribution size is about 3,470,000 sq.km. Habitat degradation and fragmentation, hunting for food and trapping for the cagebird trade are the main threats that may endanger the survival of these lapwing species. The yellow-wattled lapwing (Vanellus malabaricus) does not approach the thresholds for being Vulnerable, either under the range size criterion, or under the population trend criterion or under the population size criterion. The IUCN (International Union for Conservation of Nature) has categorized and evaluated the lapwing species and has listed it as of "Least Concern". The CITES (Convention on International Trade in Endangered Species of Wild Fauna and Flora) status is ‘Not Evaluated’ for yellow-wattled lapwing (Vanellus malabaricus). The yellow-wattled lapwing (Vanellus malabaricus) was formerly placed in Lobipluvia and Hoplopterus. Current topic in Birds of India: Yellow-wattled lapwing - Vanellus malabaricus.